Hiya guys! Do you realize it's THE week of Halloween?! If you're not as into Halloween as I am then I totally can understand skipping my gushing. 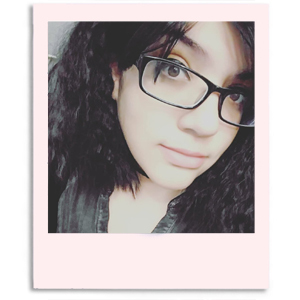 For me though it's time to watch horror movies every day and eat tons of candy. Okay, so I have been doing that since October began haha. But there is still much excitement to be had and much more nail art to share this week. Speaking of which it's time again for this months link-up brought to you by the Hobby Polish Bloggers group on Facebook. The theme for this month is Halloween, of course, so I decided to take on the prompt with one of my favorite candies. Candy corn! I can't even begin to explain why I love this candy so much. Heck it even makes me sick, but I'll still eat plenty during the Halloween month. The actual candy aside, I absolutely adore how this ended up turning out. I'm glad I decided on combining the two different styles into one mani, definitely makes it that much sweeter! For this design I used the gorgeous purple creme from Pipedream Polish called Harlequin. Everything else in was done using acrylic paint from American Craft brand and a detail brush. I ended up using some striping time to help with the lines, but I could of used straight vinyls as well. I debated whether to go glossy or not, but ultimately I had to stick with the matte topcoat like most of my Halloween designs this year. Drawing candy corn is a lot harder than I remembered it being. It's for that exact reason I am glad I work mostly with acrylic paint and not polish. Throughout the design I was able to go back in and easily reshape the candy corn until I felt they resembled the small candy. Super easy and it definitely gets the heads a turning. I must have been asked at least half a dozen times if these were wraps or decals haha. Now if you don't know, the Hobby Polish Bloggers group is home to veterans and novice blogger a like and the atmosphere is really friendly and inviting. Definitely recommend joining if you're a blogger yourself. We've been coming together and doing monthly link-ups the last few months and it has been such a fun experience. You should definitely join up and be sure to check out the other bloggers that participated in the challenge prompt this month. 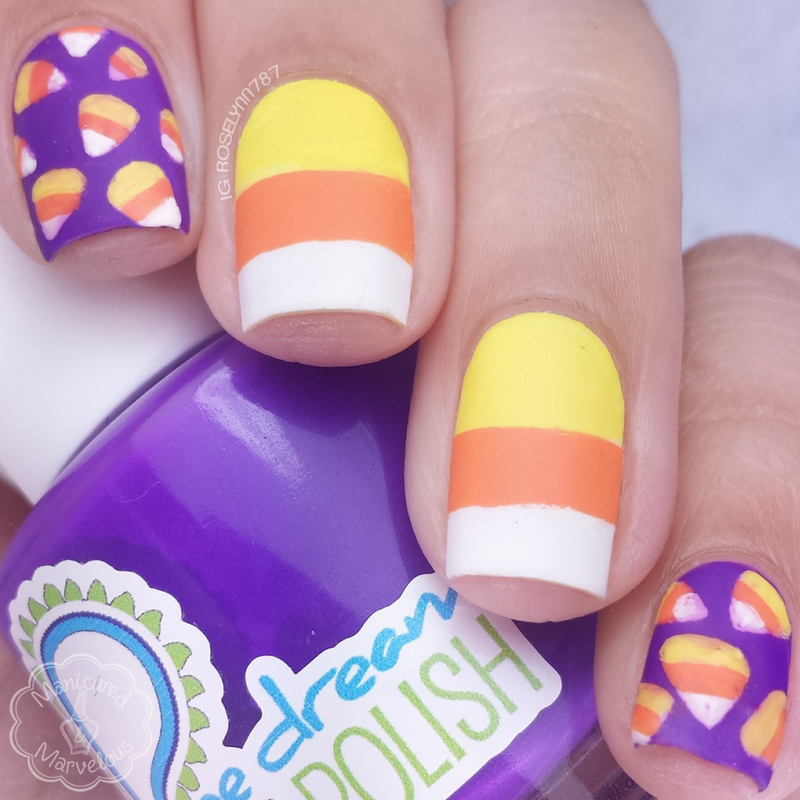 I love the idea of the mini-candy-corns with the full tri-color nails! I love the whole look! Candy corn doesn't exist in Italy but I was sent it once from the US and I loved it! I'm not a fan of the candy but I always love candy corn nail art. This is so cute! I love the bright, cheerful take on Halloween (not that I don't love dark and spooky, but this makes me smile). The purple is so great! Yes, this is super cute and I love the colors. Every year for Halloween, I attempt the Candy Corn and fail because it ends up being too difficult. Kudos to you for sticking it out and making it look fabulous! What a cute mani! I'm not a big fan of candy corn by itself, but I LOVE it in a Chex mix with peanuts and m&ms! This is so pretty! I love how the purple pops against the yellow, orange and white! These look amazing!! That polish is gorgeous! Awww.....this is so pretty. Its not the typical scary or creepy mani. Love it!!!! I adore everything about this mani! I have never had a candy corn in my life. Only seen them for nail art. haha. These are perfect and that purple is absolutely gorgeous. I don't like candy corn, but I love this mani. 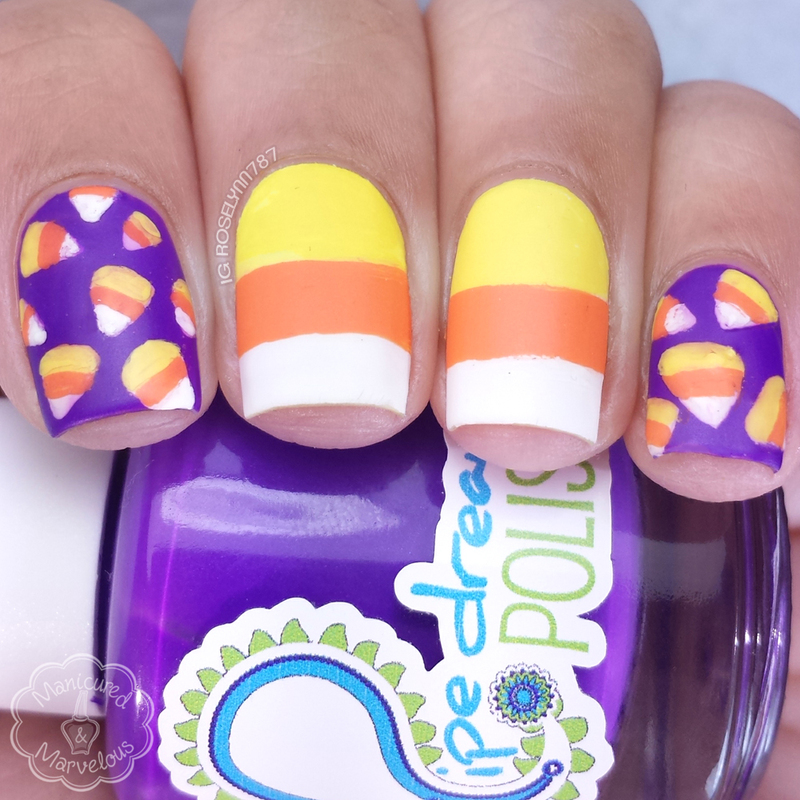 I've never tried candy corn and this mani is adorable! can you believe my husband hates candy corn?! Great idea. The color contrast is wonderful! Hehehehehe, I love love love it. I've never had candy corn in my entire life, we don't even have it here! I love your whole presentation - well done! Your little candies turned out perfect! I am a huge fan of them also even though they can make me sick sometimes too. So bright and fun...love it! So cute! I love the bright and fun colors in this. 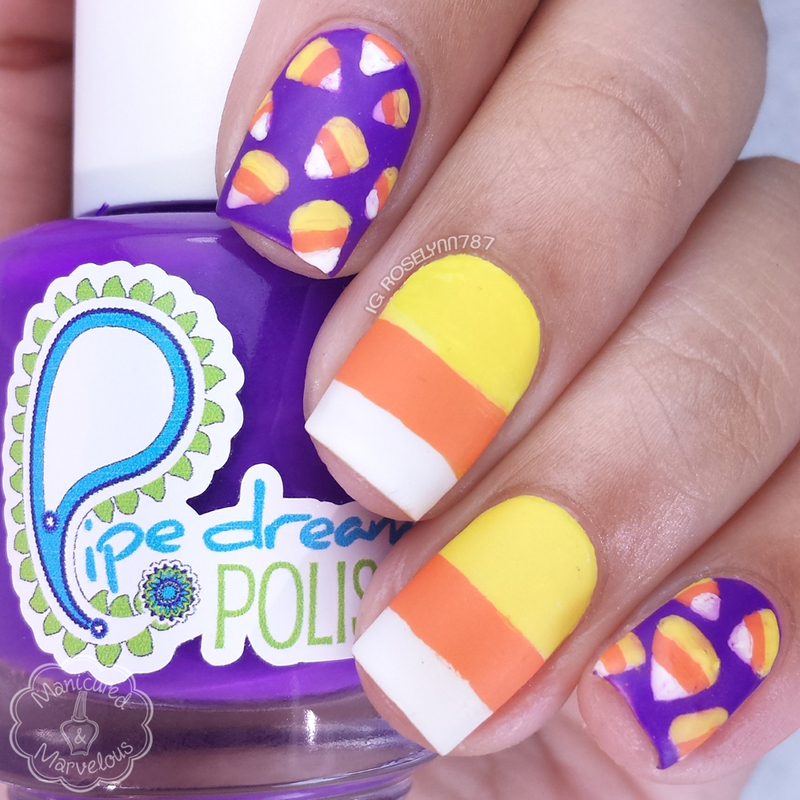 Oh my gosh, the candy corns absolutely POP off that purple background! Amazing color combo!